Glocks are excellent handguns but they’re far from attractive. An easy way to make the Glock more pleasing to the eye, as well as to improve sight support and serve other functional needs, is to update the slide. Let’s take a look at why upgrading to an aftermarket Glock slide makes sense and what the best options are on the market. Why Even Upgrade a Glock Slide? ​Gun owners can be a stoic lot who pretend not to care too much about how their guns look, but let’s be honest: the Glock can be pretty ugly despite its amazing utilitarian function. One of the easiest ways to make your Glock look more like a precious child of yours is to give it an aftermarket slide facelift. ​Do you want to add a red dot to your Glock? An aftermarket slide can be your ticket to enhanced optics. That’s no small bonus! ​One of the key factors in upgrading any component is always that, by virtue of upgrading to better quality materials, you’ll get improved longevity. Each part of your Glock interacts with other parts and one weak component puts stress on the others. If for no other reason, (and we think the other two are already good reasons!) 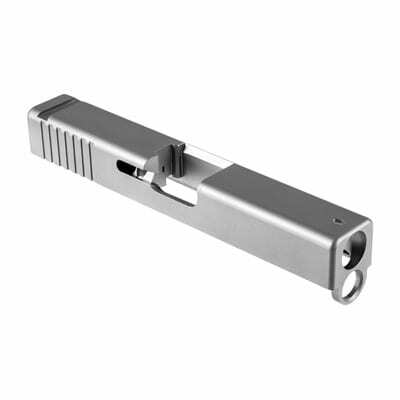 you should consider upgrading your slide to take advantage of high-quality stainless steel. ​Go ahead and be vain, because the slide is one of the most visible parts of your Glock, and slides are by and large designed to personalize its look. There are many different designs out there, so find one that suits your liking. 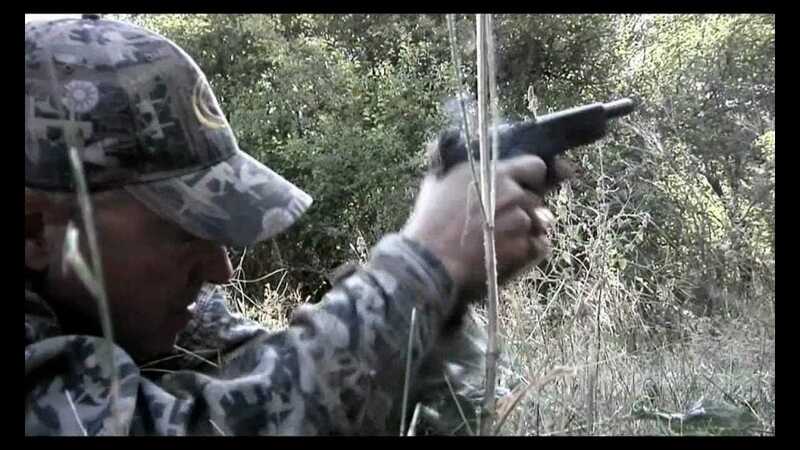 ​If you’re one of those Glock owners who likes to hunt with their handgun, an upgraded appearance can mean you get rid of that dull but shiny slide that has nothing in common with the great outdoors and exchange it for a nice woodland camo. ​As we’ve stated, a slide is about more than appearance and can introduce functional support for components like red dot sights. Even if you’re not considering upgrading your sights at the moment, this could be a big concern if you want to have room to grow! ​Some slides include optimized serrations so your sweaty hands can stay comfortable and secure. Of course, it works for any other type of moisture or adverse conditions like condensation, rain, and so on. ​Slides can include other quality of life bonuses, such as an improved contour or ejection ports that have a different positioning to keep your spent casings out of your face. Slides can provide a pretty solid set of improvements! Keep in mind that when it comes to slides, there’s a heavy focus on appearance with many brands, but you can easily find the right brand for you with careful attention to details and reap all of these extra rewards. If we’ve convinced you that giving your Glock a makeover is as functional as it is eye-pleasing, then it’s time to move on to what we believe to be the best aftermarket slides on the market. Pay careful attention to not only how each improves the appearance of the Glock, but also what it does for you when your handgun is in action. What would the average gun owner do without Brownells? Always reliable for excellent quality parts at a reasonable price, they’ve offered us these great slides, too. Right off the bat, this slide introduces some nice quality of life features. Highly distinct serrations wrap around the slide and provide an excellent texture for checking your chamber and also look substantially nicer than the default slide. Additionally, you can choose between a regular slide, an optics-cut slide, and a windowed slide. The latter makes an excellent choice for those who might be considering a beautiful barrel. Pair it with a distinctly contrasting barrel color and you’ve got an aesthetic a thousand times better than the factory Glock. By the way, a window also reduces weight and keeps air flowing around the barrel to keep it cool, so it definitely does more than just make your Glock pretty. Anyway, regardless of the slide you choose, you’ll get your standard Glock sight cuts for the rear and front sights. You also get a pre-cut slot to secure a low profile Trijicon RMR sight. 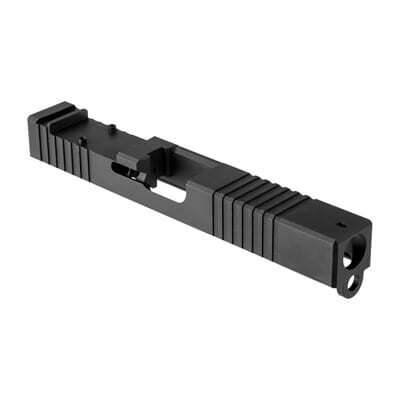 Construction is top-notch too, as the RMR Cut Slide from Brownells is machined from 17-4 stainless-steel and finished off with black nitride. Your slide will resist moisture and corrosion. Finally, you can customize your Glock by going with the default black finish, a bronze finish, or a Flat Dark Earth physical vapor deposition coat. Since this is Brownells we’re talking about, all of these options can be yours for a very reasonable price. If you consider no other slide, you would be wise to go with this one. 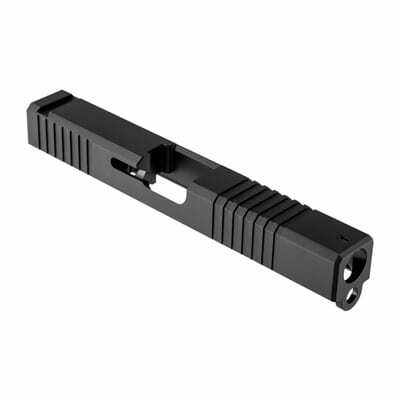 Our last note is that it will fit any Gen 3 Glock 17 or 19. If that’s your model, add this slide to your list. Featuring an improved design with better serration, an optical cut slide, the choice of a window cut, three color options, and a superior construction all make for a solid upgrade. Add in a reasonable price and you’ve got a winner. If you liked the sound of our last choice but you have no interest in a low-profile Ruggedized Miniature Reflex sight, no worries, as we’ve got the model for you right here. Or rather, Brownells does, as this slide for the Gen3 9mm Glock offers mostly the same features. Here, you get your factory Glock sight cuts so that you can still swap out any compatible sights of your choosing that are not low-profile RMR. You still get the unique, heavy wraparound serration for quick and easy weapon manipulation when checking your chamber. As with the previous entry, you can still opt for a windowed cut or a solid top depending upon your preference. Here, it might make even more sense to opt for the windowed cut as you won’t encounter the potential for a sight to block the window. Your slide is born from 17-4 stainless steel, machined to factory specs. Here, it features a rear sight dovetail and a standard front sight cut at the front, same as the factory. Heat-treated to 41-44 according to the Rockwell C scale and finished off with a matte black nitride finish, you’re adding substantial durability to your weapon when you choose to upgrade your stock slide. Our one complaint here is that you do not have the option of anything other than a black finish. We’re not sure why, since this is largely similar to the previous entrant on our list which offers three finishes but is designed for low-profile sights, and there are few other design changes. At any rate, it still comes at a great price. With a black finish that resists reflection, it remains a great compromise on the aesthetic alteration and a good value. An excellent alternative for those who do not want low-profile sight mounting, this slide is an excellent value even if we’re disappointed that the color finishing options were lost in translation. Many of our readers enjoy building their Glock all the way from the ground up with custom parts. If this is your goal, Brownells is likely to be your best friend. 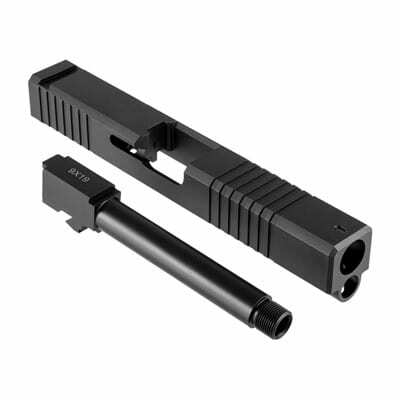 As with many of their affordable and high-quality parts, this combination kit gives you one of the excellent slides mentioned above, along with a superior barrel. Choose from the standard Glock factory dovetail design for iron sights or opt into an upgraded slide designed for RMR sights. The latter offers a lower profile. If you’re building your Glock from the ground up, you should determine what type of sights you would like at this stage before investing in the slide. You can always change it later, but this distinction is key as RMR sights sit lower and require a different slide from the factory style. As for the barrel, it is machined from 17-4 stainless steel and just like the slide, is given a black nitride finish for corrosion resistance. It is 1-10” RH with a six-groove twist. You can choose from a standard muzzle or a ½” x 28 threads per inch muzzle. Of course, you can choose whether you prefer the window-cut to easily check your chamber and enhance the temperature of your barrel and reduce recoil or the solid version with many of the same benefits. Either version includes the improved serrations for better weapon manipulation. Perfect for those who opt to do everything themselves or just need the slide and barrel upgraded, this kit is a great value, as you’ll save substantially more money buying them together than separately. In fact, it is currently being offered at such a low price we’d urge moving quickly to avoid a future hike, as this bundle is a true steal right now! If you’re building your custom Glock from the ground up, this is an excellent opportunity to not only save money on the slide and barrel as a bundled deal, but also get a serious quality of life upgrade. Some gun owners who don’t want branding on their guns will dislike the P80 logo engraved by the ejection port. Polymer80 wants you to know right up front that they went for a more aggressive look and they certainly succeeded. Offering a pronounced set of front and rear serrations as well as a heavy front chamber and strong P80 logo engraved just ahead of the ejection port, it certainly overhauls your Glock. Functionally, the serrations aid in weapon manipulation when you’d like to check your chamber. Of course, they also look cool. As for the logo, whether you like having a corporate design emblazoned on your Glock is going to be a matter of personal preference. Some will like the design, some will hate it. It’s up to you. The slide is machined from 17-4 PH stainless steel and is heat-treated to RC 42-43. This offers substantial durability over many firing cycles and should last you a very long time. It is finished off with Diamond-Like Carbon. Overall, these treatments provide corrosion resistance, wear resistance, and self-lubrication. Additionally, you have two color options, either black matte or flat dark earth so that you can customize your look. It also fits perfectly any Glock 19 holsters as it does not substantially change the dimensions. Despite its heavy serrations, it is also snag-free, making it ideal for concealed carry. A solid upgrade to your existing factory Glock slide, the P80 DLC Standard Slide for Glock 19 offers an improved hold for checking the chamber and exceptional durability. Lone Wolf is one of those brands that has spent a ton of time making Glock components and is practically synonymous with Glock themselves. So you’d expect an excellent slide from them. Indeed, the Alpha Wolf Gen 4 slides for Glock are a substantial upgrade while being very kind on the wallet. Made from 416 stainless-steel with a sleek matte finish, it offers moisture and corrosion resistance. Absolutely no fitting is necessary, as is generally par for the course with Lone Wolf. The primary advantage here, beyond the durable construction, is the serrations, which are more intelligently grouped as a dense cluster for greatly enhanced grip when checking the chamber. It also makes for a more modern design, especially when combined with the sleek finish. Because it is designed to fit a variety of Glock Gen 4 models, it is somewhat utilitarian. It’s made to be as at home on a Glock 17 as a Glock 22, for example, and therefore, it doesn’t offer a lot of specific upgrades. That’s all right, however, as the improved durability and the serrations are the most critical components, and it’s affordable enough that it makes a lot of sense as a basic upgrade for those who have more than one Glock and want to affordably upgrade their stock slide. Lone Wolf is also a huge supporter of building Glocks from the ground up and this slide is just another part of that puzzle. With super-easy installation and factory spec dimensions, it easily interacts with other components, be they Glock or Lone Wolf, and is completely snag-free and compatible with your existing holster. We like the concept of using tons of aftermarket parts, even if building your Glock from the ground up doesn’t only include Lone Wolf parts, and this slide is a great DIY component. 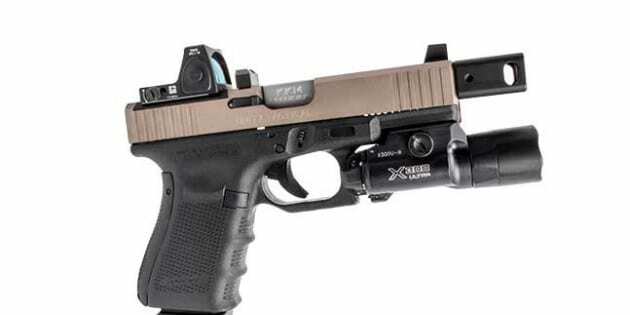 Lone Wolf went for simplicity with the Alpha Wolf Gen 4 slides, and the result is a highly affordable slide that offers utilitarian (if not drastic) upgrades to appearance and function for a variety of Glock Gen 4 models. Upgrading your stock Glock slide to an aftermarket part can improve the look of your gun, as well as improve operation. Enjoy improved serration, support for aftermarket sights, and/or a cooler barrel with unique innovations. Use our guide to know what to look for and to find the best Glock slide for you.